[Note: This post has been updated.] North Carolinians will lose their “precious right to vote,” as U.S. Supreme Court Justice Ruth Bader Ginsburg calls it, in at least one election next year if lawmakers override Gov. Roy Cooper’s veto of Senate Bill 656. “The Electoral Freedom Act” eliminates next year’s primary election for judicial races among other things. It was passed in both chambers last week and Cooper vetoed it earlier this week. His veto will be up for an override vote by January at the latest—though some lawmakers have been told that an override vote could now be scheduled for as early as next Tuesday, October 17. The only public explanation for the language about eliminating judicial primary elections next year (which was slipped into the bill via a last minute maneuver of the kind that have become commonplace at the General Assembly in recent years) has been to give lawmakers more time to tweak the redrawing of judicial and prosecutorial districts. That measure, House Bill 717, was passed by House lawmakers and is expected to be taken up by the Senate in January. It was another surprise bill and if implemented will have dramatic effects on the state’s judiciary. Anyone who has been following General Assembly news this year should not be surprised. Douglas Keith, counsel with the Democracy Program at the Brennan Center for Justice, said the state has been “more effective than most” at getting bills passed in what appears to be a trend across the nation to manipulate state courts for partisan advantage. The Brennan Center for Justice at New York University School of Law is a nonpartisan law and policy institute that seeks to improve our systems of democracy and justice. Its staff regularly studies and analyzes judicial changes across the nation, including in North Carolina. He added that he’s counted at least eight bills either filed and or passed in North Carolina that seek to manipulate the state court system for political advantage. A series of those bills—the ones directed at judicial elections—also normalize political activity within the courts, he said. “What’s happening in North Carolina makes it harder for judges to both be and appear independent,” Keith said. 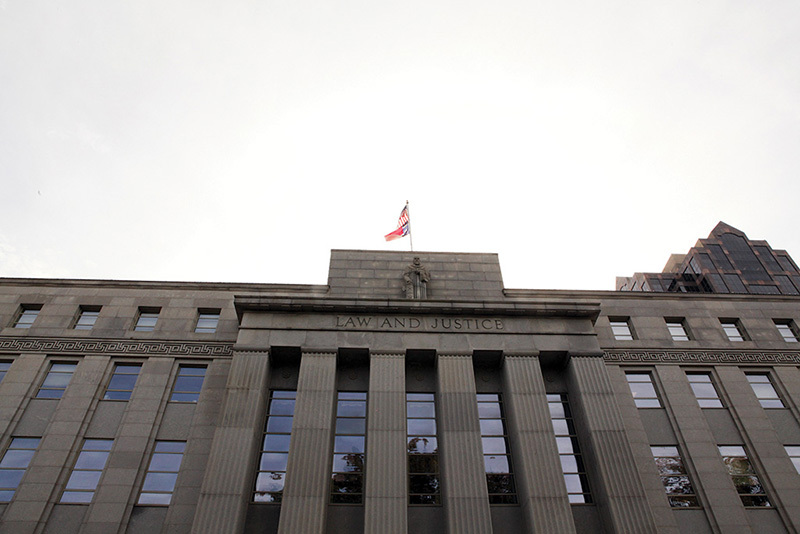 The context of the North Carolina General Assembly’s moves to change the state’s judiciary is critical to understanding the significance of measures like SB 656. The bills that have been filed work together to accomplish one thing: a Republican takeover of the courts. The GOP has been leading the state for almost seven years and its leaders have lost many a court battle during that time. With little apparent consideration of the nonpartisan nature of the third branch of government, those same Republican leaders have taken on the task of dismantling the courts and rebuilding them in their own image for a result that would likely produce more favorable results for their policies. The only other state in recent years to eliminate a judicial primary election was West Virginia in 2016, according to Keith, but the context was entirely different. The state was moving away from partisan elections. There were five candidates for that state’s Supreme Court election at the time and the winner collected 39 percent of the votes. Judicial elections are already considered, low-information races so eliminating a primary would likely make for crowded ballots and a more difficult task for voters, who are likely to rely on name recognition in such a race, according to Keith. “People have been studying judicial selection for decades and there has been no widespread call for elimination of primaries,” he added. In North Carolina, there have been at least three instances in the past 16 years in which judicial primaries were not used but none were mandated by the General Assembly. In each instance, the winner was elected with under 24 percent of the vote. 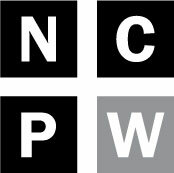 In November 2004, North Carolina Supreme Court Justice Paul Newby won over seven other candidates with 22.59 percent of the vote, according to the State Board of Elections and Ethics Enforcement. 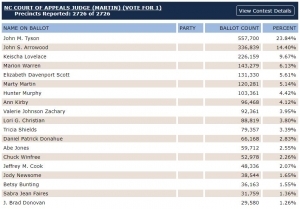 In 2014, 19 people ran for an open Court of Appeals seat. In November 2010, Cressie Thigpen received the majority of the Court of Appeals election votes over 12 other candidates at 20.33 percent, but now-retired Court of Appeals Judge Doug McCullough was declared the winner after a run-off election. And most recently, in November 2014, 19 people ran for an open Court of Appeals seat, which current Judge John Tyson won with 23.84 percent of the vote. Michael Crowell, a Chapel Hill attorney and former professor at the UNC School of Government, said the first year that a change, no matter how small, is implemented in an election, it has a tendency to attract lots of new candidates. 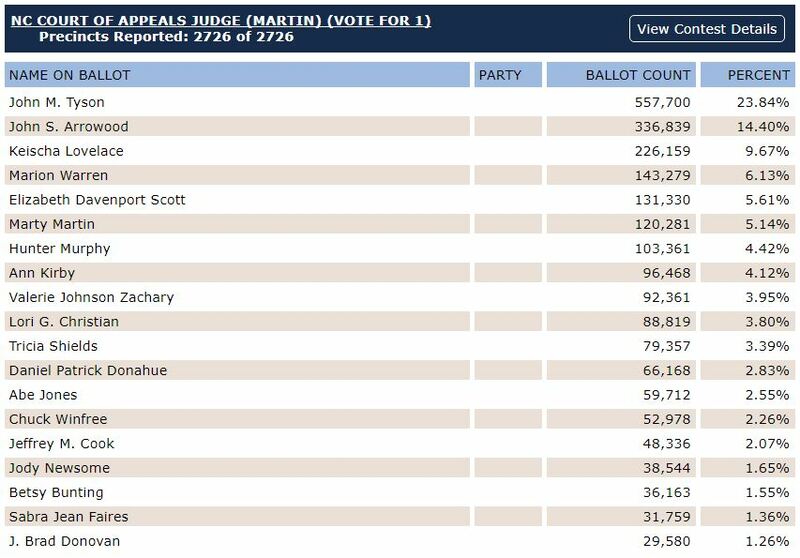 For a full breakdown of the 2014 Court of Appeals election, you can read a blog post written by Crowell here, which details how the race with 19 candidates came to be. His prediction for the win at the time proved correct. “Given the number of candidates, the short time for campaigning, the low attention paid to judicial races, and the drop-off in voting for judgeships, someone is likely to win with a small percentage of votes,” he wrote. The 2018 election season might not prove to be any different, and there are a lot of races for potential candidates from all corners to throw their names into the mix. Expiration terms show that there will be one Supreme Court race, three Court of Appeals races, more than 30 Superior Court races and more than 115 District Court races. Most of the judges in the latter two categories whose terms are expiring are registered Democrats. Of course, those numbers could change if HB 717, the judicial redistricting measure, is enacted or if lawmakers choose to implement a “merit selection” plan and voters adopt it. Eliminating a primary, as SB 656 would do, also means eliminating a requirement that judicial candidates, who now have to run on the ballot with political affiliation, obtain a certain numbers of signatures from the voters associated with their chosen party. Anyone who meets the requirements to run for judicial office, which includes a residency requirement and a filing fee equal to one percent of the salary of the office sought, can put their name on the ballot. Patrick Gannon, spokesperson for the State Board of Elections and Ethics Enforcement, said if SB 656 is enacted as it is currently written, it would create the potential for much longer General Election ballots. The State Board, he said, could not recall any need in the recent past for multi-page ballots. “That would be something new if it became necessary based on the number of candidates,” he added. Cancelling a scheduled primary wouldn’t require any significant work for the State Board, according to Gannon. Longer ballots typically means less voter participation. Crowell used an example to show that in his 2014 post. Many of these points were made to lawmakers before they voted to pass SB 656. House Minority Leader Darren Jackson argued with colleagues about the bill in a committee meeting and on the chamber floor. “It’s just a terrible idea,” he said. Other Democratic lawmakers also spoke out against the bill, noting that they needed to give voters a chance to make more informed decisions and that races for the state Supreme Court and Court of Appeals shouldn’t be included since those offices aren’t affected by judicial redistricting. Meyer said he hopes the legislature will have enough votes to sustain the Governor’s veto of the bill. He added that they were also worried if they tried to move to a legislative appointment system for judges that any candidate who filed to run in a judicial race before that constitutional amendment went into effect would have standing to sue and block the law.